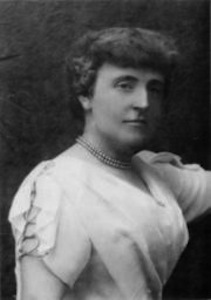 Frances Hodgson Burnett (1849 - 1924) was an English-born playwright and author, beloved for her children's books, The Secret Garden (1911), Little Lord Fauntleroy (1885), and A Little Princess (1905). She also wrote adult fiction in the 1890's, but her novels for children were most popular. After her father died in 1852, Frances's family emigrated to the United States and settled near Knoxville, Tennessee. It was there that she began writing in an effort to earn money for her family. She published stories in magazines starting at the age of 19. She married a doctor, had children, lived in France for a couple of years (inspiring her "Lord Fauntleroy" character, the book that first gained her recognition). Burnett's oldest son died of tuberculosis in 1890, which triggered Burnett's battle with depression. She remarried, lived a lavish lifestyle, purchasing a home (with a beautiful garden, no doubt) in England in the 1890's. This was the perfect setting to inspire her writing which would lead to publishing her finest novel, The Secret Garden. Burnett was also a playwright, adapting both Little Lord Fauntleroy and A Little Princess to stage productions. All three of her children's novels have been adapted into popular children's movies and plays for multiple generations to enjoy. In New York's Central Park Conservatory Garden, there is a beautiful sculpture by Bessie Potter Vonnoh (1936) dedicated to Burnett, featuring her famous Secret Garden characters, Mary and Dickon.